Gift a Stranger, an interactive Christmas site, was designed by Happiness Brussels for people everywhere to share Christmas with strangers and spread a little more happiness by sending presents to unknown recipients around the world. 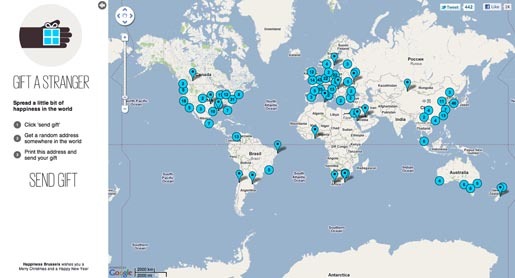 The site, online at www.giftastranger.net, uses Google’s Reverse Geocoding functionality to randomly select an address anywhere in the world which becomes the happy recipient of a surprise Christmas present completely out of the blue and from someone they have never met. Users enter their name, address, their gift and a photo or picture of their gift. Google randomly generates an address which the user can either accept or reject with a request for another address. Gift a Stranger attracted users from around the globe, with gifts being sent from Australia to Mexico and from the UK to Africa. Visitors to the site can see who has sent what present to whom. The Gift a Stranger site was developed at Happiness Brussels by creative manager Karen Corrigan, creative manager/creative director Gregory Titeca, creatives Ramin Afshar, Tom Galle, Cecilia Azcarate Isturiz and web developer Tom Scott.